LONDON (92 News) – PTI chairman Imran Khan has said that the people are very happy with the recent operation against corruption in Karachi. 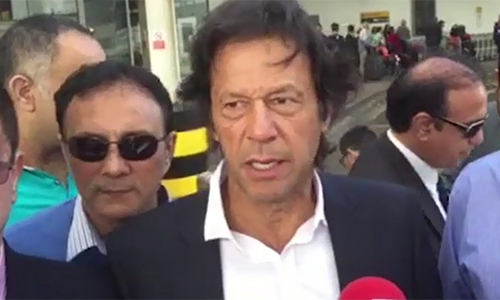 Talking to the media at the Heathrow Airport on Monday, he said that the operation should also be launched in Punjab, Balochistan and Khyber Pakhtunkhwa. He announced to hold a historical meeting in Islamabad on October 4. He said that the PML-N, PPP and MQM had struck a deal with each other regarding corruption. The PTI chairman also demanded resignations of four members of the Election Commission of Pakistan. Earlier, he was accorded a rousing welcome at the airport.